Is Judaism based on the Bible? H. Chaim Schimmel writes: “The Jewish People are frequently called ‘the People of the Book’; yet if one were to search out a people who follow the teachings of the Written Law (Torah sheBichtav) literally, one might be led to the Samaritans, or the Karaites, who are now settled to the south of Tel Aviv, but never to the Jewish People. The Jewish People do not now follow the literal word of the Written Law, nor have they ever done so. They have been fashioned and ruled by the verbal interpretation of the written word … ” How secure is the rabbis’ belief in an authority that takes the Jews so far away from the literal meaning of the Bible? See our article, ‘the House built on Sand – rabbinic Judaism and the oral law’ and ‘Rabbinic authority and the oral law’. Faith and works / Law and Grace? The identity of the Messiah is usually considered to be the pivotal issue that divides Judaism and Christianity. 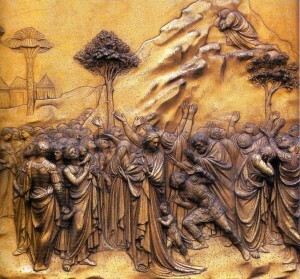 However, in “Nine questions people ask about Judaism” Dennis Prager and Joseph Telushkin suggest that this is not the most important question: “The major difference between Judaism and Christianity lies in the importance each religion attaches to faith and actions.” In Faith over Works we examine whether this is an accurate reflection of the positions of either Judaism or Christianity. See also The Torah of Messiah. “The second destruction of Jerusalem in 70 C.E., along with the loss of the second temple, marked a watershed in Jewish history. “The Temple of Messiah” investigates the development and divergence of Church and Synagogue in response to the tumultuous events of the first century which culminated in the loss of the Temple as the focal point of Jewish religion. See also The Great divide between Church and Synagogue and Heirs of Abraham – What is the orthodox faith of Israel? We have a comprehensive list of articles dealing with Messianic prophecies and how they are fulfilled – click on Messianic Prophecies for a full list of articles. eg. The Resurrection and vindication of the Messiah considers the idea of a suffering Messiah in light of Jewish messianic expectations. The question of “Who is a Jew?” remains a contentious and unresolved issue, relating as it does to the ‘Law of Return’ and the nature of the ‘Jewish State’ as well as to the question of whether Jewishness is necessarily connected with either the practice of Judaism or Zionism. See HERE for a brief overview of the diverse elements that constitute the Jewish people today. Is the gospel for Jews? There is a growing lobby within the Christian Church that repudiates missions to Jews on the basis that they do not need to accept Jesus as their Messiah in order to be saved. Our response to John Haggee’s ‘In defense of Israel’ challenges this notion – see “In Defense of the Gospel” . We also look at the supposed scriptural basis for a “Renunciation of Missions to the Jews” – see “Make disciples of all nations”. Others anticipate that God will Himself, by some supernatural act – most probably at the second coming of Messiah – accomplish such a conversion. i.e. without the gospel and without our assistance. See in this regard, our article on They will look to Me whom they have pierced – Zechariah 12 and also our exposition on Romans 9 to 11 – All Israel will be saved. There are several essays and studies on many controversial issues over which believers are divided, particularly in relation to the subject of Christian Zionism and Dispensationalism. There are also articles dealing with the problems of Judaizing. These can all be found under CHALLENGING POPULAR CHRISTIAN ERRORS.